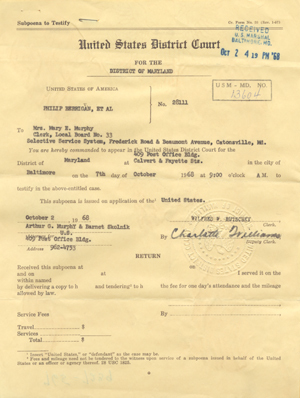 An original subpoena document and a note from Arthur G. Murphy, 1st Assistant U.S. Attorney, sent to Mary E. Murphy, in order to testify in the case against the Catonsville Nine. Selective Service System, Frederick Road & Beaumont Avenue, Catonsville, Md. testify in the above-entitled case. This subpoena is issued on application of the¹  United States. Arthur G. MurphY & Barnet Skolnik                                                                                   Clerk. ¹  Insert "United States," or "defendant" as the case may be. States or an officer or agency thereof. 28 USC 1825.